IRVINE, CA--(Marketwired - Apr 6, 2016) - Boot Barn Holdings, Inc. (NYSE: BOOT), America's largest western and work wear retailer, has named country music star and Black River Entertainment recording artist Kelsea Ballerini as the face of Shyanne®, one of their most successful, exclusive brands for women. The recently awarded ACM New Female Vocalist of the Year will represent the popular brand in radio, print, in-store and online promotions, as well as on social media. "I know how much Boot Barn supports country music and country music artists -- both established and emerging -- so representing Shyanne is something that feels very natural to me," said Ballerini. "Plus, many of my fans are Boot Barn customers so this gives me another way to share and connect with them." Recently, to celebrate the partnership, Ballerini and Boot Barn teamed up to give away 30 pairs of new boots to the students in the Leadership Class at Dinuba High School in Dinuba, CA, as a reward for spearheading the school's annual food drive competition to benefit FoodLink. Their hard work and passion for giving back to the local community exemplifies the spirit of the Shyanne brand. Dinuba High School, along with eight other high schools in Tulare County, participated in this intense competition running from November 2 through November 24 to bring in the most pounds of food for the grand prize win: an on-campus concert with Kelsea Ballerini presented by106.7 KJUG COUNTRY, HITZ 104.9, 99.7 Classic Rock and My 97.5 FM. On March 29, Ballerini performed a memorable concert on Dinuba High's football field, including her smash hits "Love Me Like You Mean It" and "Dibs", and new single "Peter Pan." Following the show, the singer/songwriter met the students and signed autographs. "We are thrilled to have Kelsea Ballerini as the brand ambassador for Shyanne," said Jayme Maxwell, Vice President of Marketing at Boot Barn. "Shyanne is all about high quality, style and value. It's a brand that really connects with the lifestyle of country music fans and embraces the country values they hold dear. Kelsea is the perfect choice to represent Shyanne's blend of traditional western style and fresh American design." Boot Barn has been outfitting the West since 1978 and is America's largest western and work wear retailer. Boot Barn has over 200 stores from coast to coast and online shopping via their mobile-friendly website. Boot Barn is the official western retailer of the PRCA, NFR and PBR, an official sponsor of the Houston Livestock Show and Rodeo, the Fort Worth Stock Show and Rodeo, the San Antonio Stock Show and supports over 500 rodeos and western events every year. For more information, call 888-Boot-Barn or visit www.bootbarn.com. Kelsea Ballerini launched to stardom with two consecutive #1 smashes -- the GOLD-certified "Love Me Like You Mean It" and infectious follow-up "Dibs" from her critically acclaimed debut album The First Time. The Black River Entertainment recording artist is the first solo female artist in 15 years to hit #1 with her first two country singles and one of only 11 women to have ever hit the top of the charts with a debut. Abuzz with high-profile media looks, she has been named "The Country Sweetheart" in People Magazine's elite "Ones to Watch" portfolio, touted by Billboard Magazine as "Country's Next Queen," praised by Rolling Stone as the "Nashville It Girl" and selected as one of CMT's Next Women of Country. The talented singer/songwriter's credit is featured on all 12 songs on her debut, including her third single "Peter Pan" which is flying up the country radio charts. Racking up her first CMT, CMA, AMA and Radio Disney Music award nominations, she received Billboard's "Rising Star" award at the prestigious 2015 Women In Music event and just earned her first-ever ACM award win for 2016 New Female Vocalist of the Year and performed on the live broadcast on April 3. Previously sharing the stage with Alan Jackson, Lady Antebellum, Tim McGraw, Carrie Underwood and Keith Urban, she recently returned from her first international trek to Australia to perform at the Country CMC Rocks Festival and will join select dates this spring with Billy Currington and Rascal Flatts. For more information, visit KelseaBallerini.com. Reach out to her on Facebook, Twitter, Instagram and YouTube. Kelsea Ballerini with Dinuba High School student. 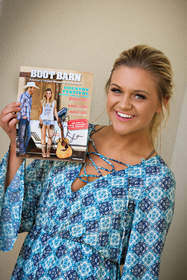 Kelsea Ballerini with the latest Boot Barn catalog featuring her as the face of the Shyanne brand.